I just heard about Fun Retrospectives - seems like a worthy goal. They offer a retrospective tool, http://funretro.github.io/distributed/, that seems like a shinier version of http://ideaboardz.com/ but a few minutes of playing with it suggested it didn't have the latter's serverside wonkiness. Sorry for the clumsy blog entry title, I'm trying to up the google juice. Digging my way out of problems with iTunes, I would like to drag a music file from my old archive to a new location; but the gotcha is I want it to copy a subset of the the path (containing the artist and album info) from the source folder to the destination folder. It's a little clumsy, but does the job. Of course, folder and file name hackery is kind of an ugly way to deal with photo metadata, but over the years it's the only thing I've been able to trust. In a similar note, I've noticed a whole bunch of music missing from iTunes. Not sure what happened, but I think I may have to resort to similar easy-to-backup, possible-to-verify handling for my music and playlists, rather than relying on an endless "smart playlist" for getting back to my new music. For my homebrew blog, I use a drag and drop photo uploader script combined with some ImageMagick resizing. I so wish I had written it many years ago; my blog is one of my most reliable archives, and my new scripts' method of generating viewable-sized versions - but with links to the fullsize originals - would have kept some big image files safe that I've since lost track of. C'est la vie. I'm putting the code here on the offchance someone else finds it useful. I'm also putting it on my old Perl cheatsheet... kept in a homebrew database system I've been using for over a decade. These days, Simplenote probably does a better job for this kind of stuff, but I didn't have Simplenote and Dropbox back then - they are pretty awesome though. I've grown to distrust iTunes, sadly. A month or two ago I noticed one album that I remembered having (Mario Bros the Movie soundtrack... don't judge.) was missing. The other week I realized a King Missile album wasn't there, and today a difficult-to-replace album from a college A Capella group I worked with once (again, don't judge). Some of these files I can recover from old file backups. Plus I had a copy of iTunes' "Library.xml" (What you get when you goto "File | Library | Export Library") from when I switch my collection to my mac so I should be able to figure out what has flown the coop. at least nesting these things into a wrapper, so it's an iterable set? Do I just not "get" the magic of XML in this case? Like a breath of fresh air, ain't it? Anyway, here's the relevant bit of script: (small.xml was my test file, and when I'm ready to gear up to the real files, I'll add multiple calls in the "$.when()" so that files are loaded in parallel and work doesn't begin until all are loaded. So, that's it - it was a little harder to assemble than it looks, I haven't had to use $.next() and fancy proximity CSS-ish selectors that much before. I still have to accept the fact that if I add in old songs to iTunes, there's virtually no way to get iTunes to not treat them as new songs, and that will absolutely screw up my rolling "new music" Smart Playlists. But it's better than not having my old music at all. Over the years I've put in a fair chunk of work on integrating Google Maps into Porchfest websites and using that core to make up posters as well. The music festival HONK!TX takes what looks to be an easier approach - if you look at their schedule page the "Map It!" links go to instances made in something called Google My Maps that can even be embedded on other websites. This might be an easier bet for small organizations that don't have a lot of developer firepower. The :target Trick ... some cleverness you can do with the #url fragment and CSS. Sometimes it's fun to avoid jQuery etc, but other times I wonder if it's worth the fiddling with the browser history. 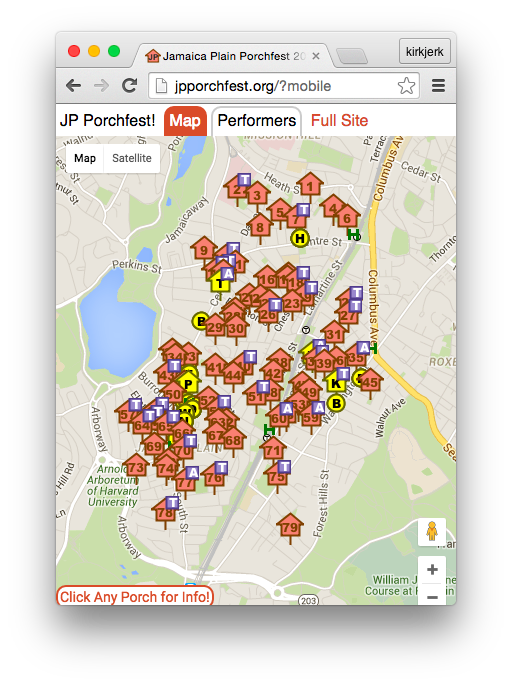 I'm proud of the mobile mode of the JP Porchfest website - I think it looks ok and it's easy to both scoot around the Google map, get information on what's playing at a certain porch, as well as look at the big block schedule.